SSC has shown its height of level again after CGL 2013 Tier-II re-exam! The question paper was far and far tougher than CGL 2013 tier-I re-exam. We will discuss here part-wise review. Go through! General Intelligence (GI) : The GI section was the most easy part among the rest of the sections. In an average, candidate were able to attempt between 40-45 questions out of 50 questions. Aspirants need not apply too much logic for the questions. In one word, the questions have easy logic. Questions were asked from number/ alphabet series, code-decode, arrange according to dictionary, statement-inference, question-answer figures, venn diagrams, matrix etc. Quantitative Aptitude : One of the toughest section of the question paper. Some of the questions were very confusing and time-consuming. It has taken around 40-45 minutes to solve 35-40 questions! But the geometry and trigonometry questions were surprisingly easy. The rest of the questions were asked from profit & loss, percentages, algebra (was tricky and very calculative! ), boat & stream, time & work, pipe & cistern, HCF, LCM, proportion, mensuration etc. English Comprehension : It is the toughest section of the paper. Even the questions are tougher than the questions asked in SSC CGL 2013 Tier-II re-exam! Specially the most of one word substitution and idioms/ phrases questions are unknown to the candidates. There were two passages which were too lengthy. General Awareness : This section was moderate and as usual. Specially the questions from economic were too tough and confusing. So, it can be seen that the overall question paper of SSC CGL 2014 Tier-I exam held on 19.10.2014 was tougher than CGL 2013 tier-I exam and previous years' exams. It is really a tough task to attempt more than 135-140 questions within stipulated time. After the exam, according to us the cutoff marks for SSC CGL 2014 tier-I exam will not exceed 100 (for Gen category) like 2013 re-exam. Friends, share your attempts and expected here as comments. 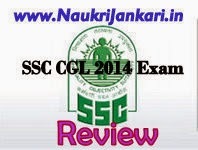 3 comments for " Review on SSC CGL 2014 Tier-I Exam held on 19.10.2014 "